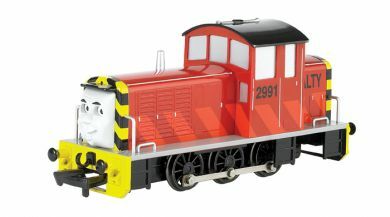 Salty is a BR Class 07 Diesel shunter. The number he has, 2991, is a real BR number belonging to a member of the class; this locomotive escaped the cutter's torch by becoming a static generator at Eastleigh Railway Works and is still working there under the ownership of Knights Rail Services as of March 2007. This class of locomotive worked at Southampton docks, where they replaced the older Southern Railway USA Tanks (Rosie's class).